The beginning of a new year is a great time to plan to make changes to your house, your overall property, and your garage. 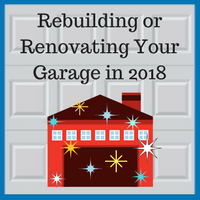 As spring approaches and the weather warms up, this is a great time to consider renovating your garage or building a completely new garage. When planning for a new or renovated garage, there are many factors to consider, such as style, size, space, materials, and door types. Choosing a garage is not a one-size-fits-all type of situation. Each homeowner should consider their options and determine how to create a garage that will fit their specific needs. The choice of garage door can come down to what fits the style of your home, but it is important to make sure that your door will provide safety and security while continuing to function correctly throughout its lifetime. Metal and fiberglass garage doors tend to last longer because of their durability. While wooden garage doors are more expensive, they may add property value to your home because of their attractive appearance. In the Chicago area, where we often experience extreme temperature changes, it may be in your best interests to consider a fiberglass garage door. Not only is fiberglass durable, it can also help insulate your garage, resulting in savings on heating costs. Most single car garage doors are between eight and nine feet wide. Many homeowners prefer a wider door, since this reduces the chance of scratching their car by scraping it on the sides of the door. For a two-car garage, doors are usually 15 to 16 feet wide. It is a good idea to make sure that your garage provides at least three feet of space on each side of a car, which will allow enough room to open doors and move around throughout the garage. If you need additional room in your garage for storage or to fit equipment such as a hot water heater or large mechanical tools, then you may want to add some extra depth or width to the garage. If you have plans to renovate your garage or build a brand new garage in 2018, you can count on Blue Sky Builders to help you create a garage that will fit your needs and provide value to your home. Our garage professionals have more than 38 years of experience providing homeowners with custom garage solutions, and we are ready to help you build the ideal garage for your home. If you have any questions about rebuilding or renovating your garage, please contact us at 630-852-8485.